Peptide receptor radionuclide therapy (PRRT) has recently been established as an important treatment modality for somatostatin receptor (SSTR)-positive tumors. The purpose of this study was to evaluate the clinical response, side-effects as well as the quality of life following 90 Y-DOTA-lanreotide (DOTALAN) and/or 90 Y-DOTA-Tyr 3 -DPhe 1 -octreotide (DOTATOC) therapy in patients with progressive metastatic disease during a 6-year follow-up period. Following dosimetric evaluation with 111 In-DOTALAN and 111 In-DOTATOC, 13 patients with estimated absorbed tumor doses of >5 Gy/GBq (carcinoid, n = 5; radioiodine-negative thyroid cancer, n = 4; gastrinoma, n = 1; insulinoma, n = 1; glucagonoma, n = 1; glomus jugularis tumor, n = 1) were assigned for PRRT. A dose of 925 MBq of 90 Y-DOTALAN (four patients) or 1.85-3.7 GBq of 90 Y-DOTATOC (10 patients) was administered intravenously and repeated every 4-8 weeks. Tumor dosimetry was performed prior to and under therapy, re-staging every 2-3 months. Pain intensity, Karnofsky score and general symptoms were evaluated in order to determine quality of life. Patients were followed until death. Altogether, 53 infusions of PRRT (1.85-14.1 GBq) were administered. After the first follow-up of 3 months of 90 Y-DOTALAN therapy, stable disease (SD) was observed in one patient and progressive disease (PD) in three patients. With 90 Y-DOTATOC therapy, SD was found in all 10 patients. During the re-evaluation period (4-27 months), one patient had to be shifted from 90 Y-DOTALAN to 90 Y-DOTATOC therapy due to reduced 111 In-DOTALAN uptake after 5.5 GBq. In the first 6 months after PRRT with DOTATOC, SD was found in nine of 10 patients and PD in one patient. Thereafter, SD was observed in two patients and PD in eight patients. Nine of 13 patients after PRRT with either DOTALAN or DOTATOC died. None of the patients had experienced severe acute hematological side-effects. Transient thrombocytopenia or lymphocytopenia was seen in 10 patients after 3.7 GBq, and a skin reaction in one patient. Total accumulated kidney dose ranged between 4 and 64 Gy, with reduced creatinine clearance in two patients. Pain relief was achieved in three of three patients after ~3.7 GBq ERT within 4-6 months. Appetite, weight, Karnofsky score and general well-being had improved in patients with SD during and after therapy. Based on the results of this study conducted on a small group of patients, we conclude that PRRT may offer an alternative treatment option for SSTR-positive tumors, with only mild transient side-effects and a marked improvement in the quality of life. Radiopharmaceutical therapy, once touted as the "magic bullet" in radiation oncology, is increasingly being used in the treatment of a variety of malignancies; albeit in later disease stages. 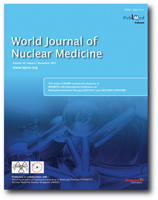 With ever-increasing public and medical awareness of radiation effects, radiation dosimetry is becoming more important. Dosimetry allows administration of the maximum tolerated radiation dose to the tumor/organ to be treated but limiting radiation to critical organs. 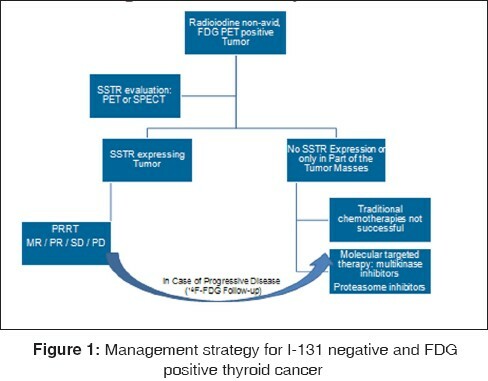 Traditional tumor dosimetry involved acquiring pretherapy planar scans and plasma estimates with a diagnostic dose of intended radiopharmaceuticals. 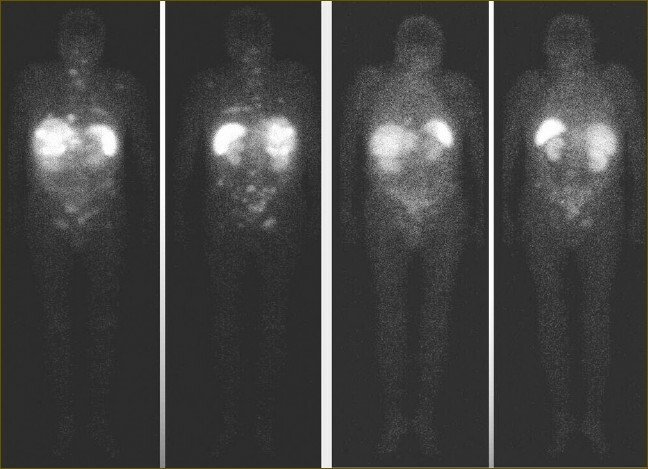 New advancements in single photon emission computed tomography and positron emission tomography systems allow semi-quantitative measurements of radiation dosimetry thus allowing treatments tailored to each individual patient. 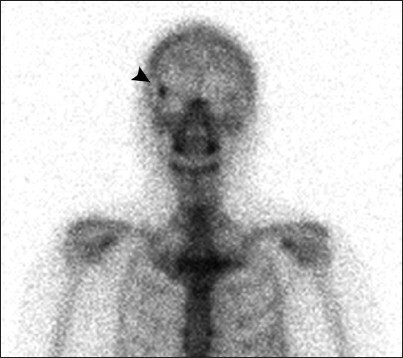 Findings of a solitary "hot spot" at the superior lateral orbital margin on bone scan scintigraphy is not uncommonly seen, and is often dismissed as a benign lesion. However, the exact etiology is indeterminate. We present two cases in which hybrid single photon emission computed tomography/computed tomography imaging was able to characterize and localize this uptake, demonstrating correlation to the right fronto-zygomatic suture.